A picture taken by NASA's Terra satellite yesterday (Sept. 13) shows Guatemala's Fuego volcano spewing smoke and ash, which is being blown west from the volcano. When Guatemala's Fuego volcano erupted yesterday afternoon (Sept. 13), a NASA satellite had a bird's-eye view on the spectacle. The Fuego eruption is causing ash to fall in the surrounding area, prompting evacuation orders for as many as than 33,000 people, according to news reports. It is also spewing lava flows that are traveling up to 2,000 feet (500 meters) down the mountain and creating pyroclastic flows, clouds of flowing hot gas and debris. A picture taken by NASA's Terra satellite yesterday shows the eruption's plume of smoke and ash, which is being blown west from the volcano. That's good news for residents of Guatemala City, which lies not far to the east of Fuego. The plume has deposited about an inch (2.5 centimeters) of material near the volcano, according to several sources. The 12,346-foot-high (3,763 meters) Fuego volcano is one of Central America's most active volcanoes and geologists have observed several smaller explosions there over the past few weeks. This is the second large eruption for Fuego this year, and likely the biggest in a decade, said Erik Klemetti, a geoscientist at Denison University in Granville, Ohio. Still, it's not unusual for the volcano, which is in an active phase that could last for a few more months or years, he told OurAmazingPlanet. The eruption may be diminishing today, according to CNN, though evacuation orders and alerts remain in effect. The average height of the column of smoke had decreased from about 6,500 feet (2,000 m) to 2,300 feet (700 m), CNN reported. "But there's no way to look at [Fuego] now and say how long the eruption will last," Klemetti said. Typical eruptions at Fuego last a few days to more than a week, he said. Off the coast of Central America, in a process called subduction, the Cocos tectonic plate slides beneath the Caribbean plate, producing enormous quantities of magma that feed Fuego and other volcanoes in the region, Klemetti said. Fuego is one of the most dangerous volcanoes in Central America, he said, capable of large eruptions and situated close to Guatemala City, which has a regional population of more than 4 million people. 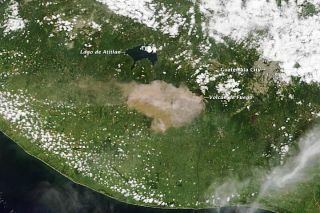 The largest recent eruption of Fuego occurred in 1974, spreading ash up to 8 inches (20 cm) deep more than 31 miles (50 kilometers) from the volcano, according to the U.S. Geological Survey.